Lean Jax held its’ Introduction to Lean Facilitation Part II course at the North East Florida Safety Council on November 20, 2018. The course included participants from Clay County Sheriff’s Office and Safariland. The group spent the day learning hands-on Lean exercises to use while facilitating Lean improvement events in their organizations. James Bussell kicked off the morning by conducting an ice breaker, presenting the course introduction, recapping Introduction to Lean Facilitation Part I, and discussing the participants’ upcoming Lean facilitation projects. Mirth Creative Co’s Robert Reid proceeded to lead the participants in a two-hour hands-on communication workshop. Robert’s highly-entertaining and valuable workshop leveraged improvisational comedy to guide the members through a series of exercises focused on improving the ways we communicate with our customers, co-workers and project teams. The two pillars of Lean thinking are continuous improvement and respect for people, and Robert’s exercises provided insight in how to effectively incorporate them into every conversation, interaction, and meeting. The participants had a blast as you’ll see below. During the afternoon session, James Bussell facilitated the Lean Marshmallow Game. 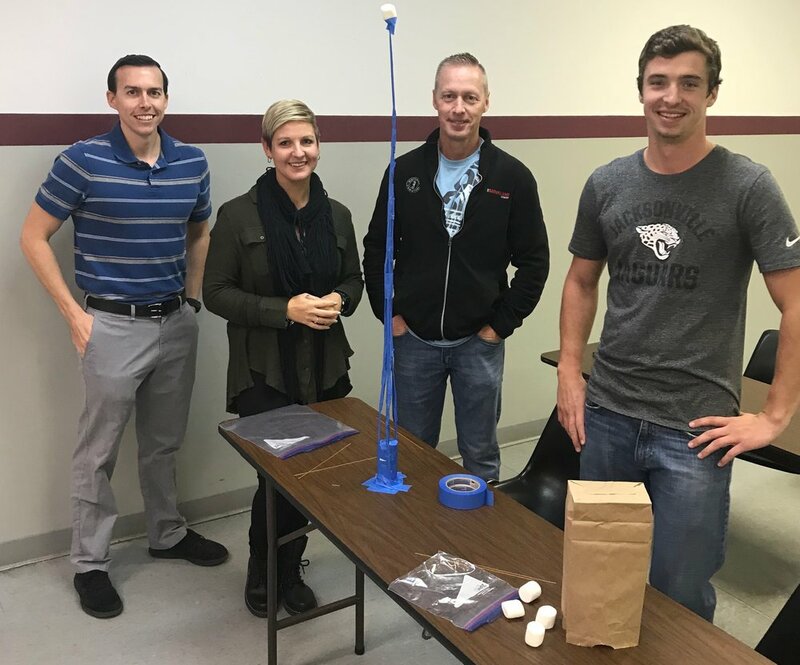 Two teams were tasked with building the tallest free-standing marshmallow tower they could in 18 minutes while only using tape, uncooked spaghetti, string, and a marshmallow. This exercise presented the benefits of front-end collaboration, teamwork, problem solving, communication and experimentation through the DMAIC (“Scientific Method”) process. See the photos below for the results. James then facilitated the Lean Paper Airplanes Exercise. Two project teams were instructed to build dart paper airplanes for their customers. The teams completed four 5:00 iterations, showing the Craftsman, Mass Production, Lean Production, and Lean Kanban approaches. The first two iterations were rife with the 8 Wastes, including: overproduction, high WIP inventories, considerable defects, rework, and waiting. For the two Lean iterations, the participants utilized pull production, one-piece flow, and Kanban. These Lean methods helped level load the production line to drastically improve productivity and quality, eliminate waste and maximize customer value. The teams were able to move away from batch production to create a robust process with seamless, one-piece flow. The use of Kanban cards between work stations enabled the teams to set up a pull production system in which internal customers could present a visual signal to upstream operators signaling a request to receive materials and information. This exercise is beneficial not only to manufacturing companies, but to any company looking to significantly improve their processes and workflows. The participants began their Lean training with Introduction to Lean and Value Stream Mapping, followed by A3 Problem Solving, and concluding with Introduction to Lean Facilitation I and II. Each course included a homework assignment that tasked the participants with effectively applying Lean principles and methods to their work. They’re now assigned with selecting, planning, and facilitating a RIE in their organizations. They’ll utilize the hands-on Lean exercises to teach RIE team members the Lean principles and methods during the events. Upon completion of the RIEs, Lean Jax will certify the group in Lean Facilitation and serve as a resource for their future improvement events and initiatives.